Euphoria is a superior blend of selective heredity between the popular cannabis strains of Royal Medic and Shark Shock. Royal Medic is a strain of cannabis that owes the majority of its genetics to the Juanita la Lagrimosa and is recognized as one of the high CBD strains and those genetics have been passed on to Euphoria. 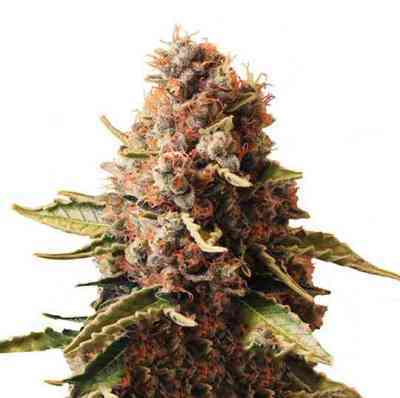 Shark Shock is a strain that has been a flourishing champion of the High Times Cannabis Cup since the late 1990s and it is a tremendously hardy grower. You will find those qualities are ever present in the Euphoria strain. CBD is an abbreviation for cannabidiol, which is often great for combating medical conditions such as Crohn's Disease and Multiple Sclerosis. Those who suffer from medical conditions that induce pain and discomfort, often turn to strains of cannabis that are known to be higher in CBD. Euphoria inherited this high CBD and contains more CBD than it does THC but, the percentages are pretty close at 10% and 9% respectively. 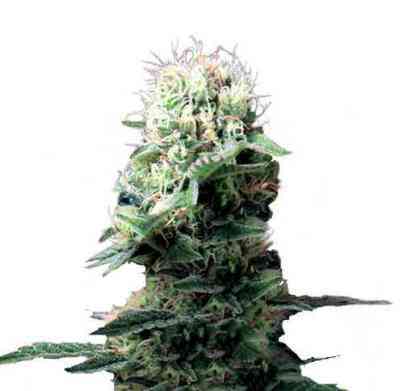 Many users of this strain, consider the Euphoria seeds to be perfect for producing a plant whose smoke is thought to be high energy, with an inclination for users of this strain to feel more social. This actually makes it great for those who experience social anxiety and is generally considered to be one of the medical cannabis strains. Euphoria's genetic background thoroughly infuses this strain with a sweet and particularly fruity scent that continues on into the taste for quite a pleasant smoke. Being that it is 20 percent Sativa and 80 percent Indica, there is more of a euphoric mood that does not encourage sleepiness but is great for pain and nervous tension relief. This makes for great medical weed. It is a short to average size plant reaching heights outdoors of 80 to 110 cm. With indoor heights established at 60 to 100 cm, due to the high percentage of Indica which are in general, shorter and stockier plants. The yield produced by this plant is quite nice from the Indica structure. You will time and again find indoor and outdoor yields of 400 to as much as 450 grams, per dried plant with no more than an 8 week flowering period! So. Das war eigentlich der GEwinner. Ich hatte Somango, Bona Dea, meine eigene Marke, und die Euphoria. Ich gab es einem Arbeitskollegen mit, weil die mal wieder einen rauchen wollten, und weil seine frau Migräneanfälle hatte. Diese hatte Sie nun schon länger nicht mehr, aber die Euphoria war die Marke, die bei ihm gewonnen hatte, und ihm am besten gefallen hatte. ein anderer Arbeitskollege hat einen Bandscheibenvorfall. Und manchmal braucht der richtig starke Schmerzmittel. So, da hatte ich ihm ebenfalls davon gegeben. Jetzt sagte der mir, das die schmerzen leicht weniger wurden, also besser, aber anders zu spüren auch. das kommt meiner Philosophie schon sehr nahe, das der schmerz erträglich oder verkraftbarer wird, aber man merkt noch, das etwas nicht in Ordnung ist, und achtet weiter darauf so, anstatt den Schmerz zu vergessen, und nach dem Schmerzmittel ist somit wegen Tätigkeiten, die ausgeübt wurden, noch schmerzanfälliger. wegen nicht gespürter Überbelastung. Also schon mal in seiner Form dafür in Ordnung.